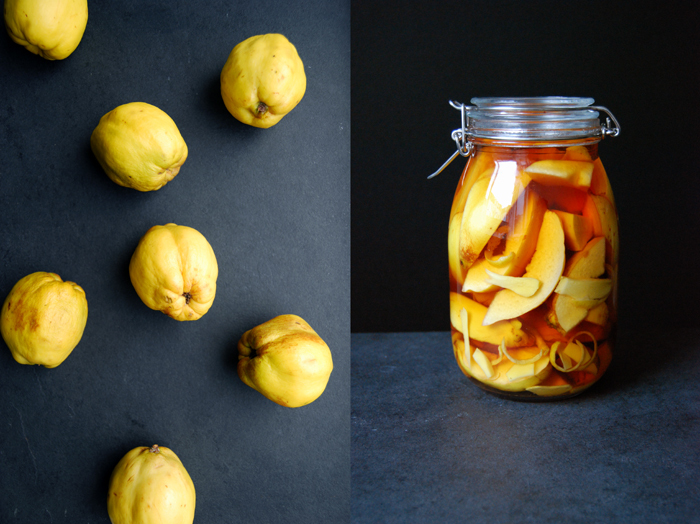 This is one of my little kitchen traditions, every year in November, I go to the market to buy quinces to make Nigella Lawson’s Quince Brandy with Cinnamon and Star-anise. After a few weeks, the spirit turns into an aromatic composition that works wonders in mince pie fillings, stews or to deglaze meat and vegetables. But this year, things have changed! I will celebrate the first anniversary of my blog on the 23rd November, a whole year of my own and some of my family’s recipes written on the pages of eat in my kitchen. 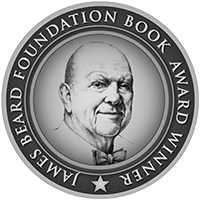 Here, I found my playground where I can write about all my culinary ideas and creations, my new finds and beloved traditions. I cook and eat the food in my kitchen but there are no words to describe how thankful I am for all the response and support I get from you. There are moments when it all feels so overwhelming and almost unreal. 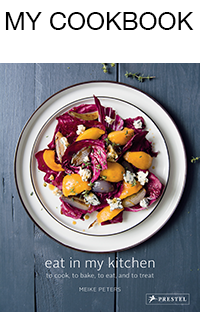 It’s a great inspiration for me to stay creative and open in the kitchen! 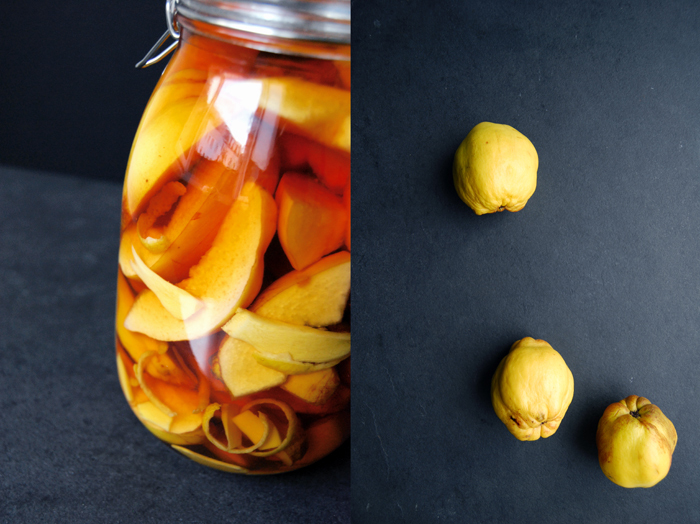 As Nigella already came up with the best recipe for her wintery cinnamon and anise brandy, I started to think about a variation on it that would create a completely different taste without disturbing the quince. I wanted something more fresh and fruity but still powerful enough to refine all the various recipes that I’ll need it for in the next few months (especially at Christmas time). 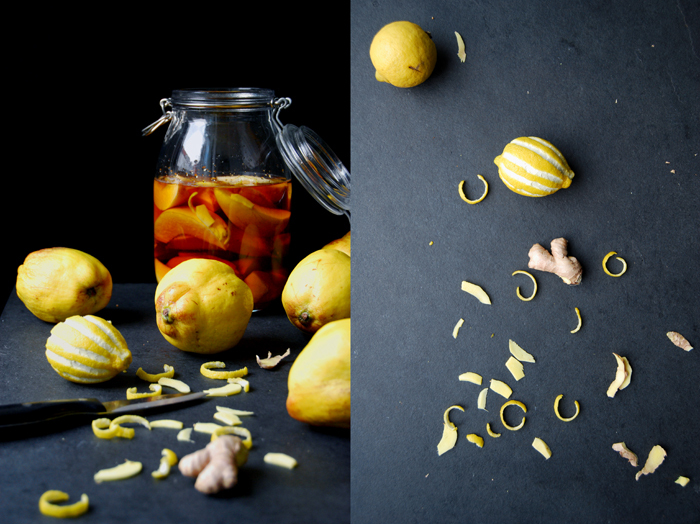 The strong and dominant aroma of ginger and lemon peel seemed like the right choice to me. And although it’s only been a few days since I prepared the jar, I can already say that the result is very satisfying. I think I’ll use it soon for my first mince pies of this season and until then I’ll just enjoy its amber coloured beauty on my kitchen top. 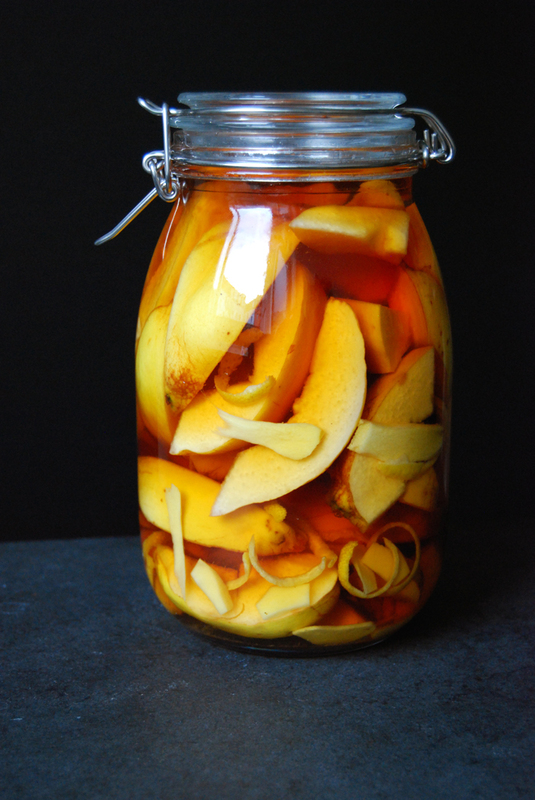 Fill half of the jar with brandy. 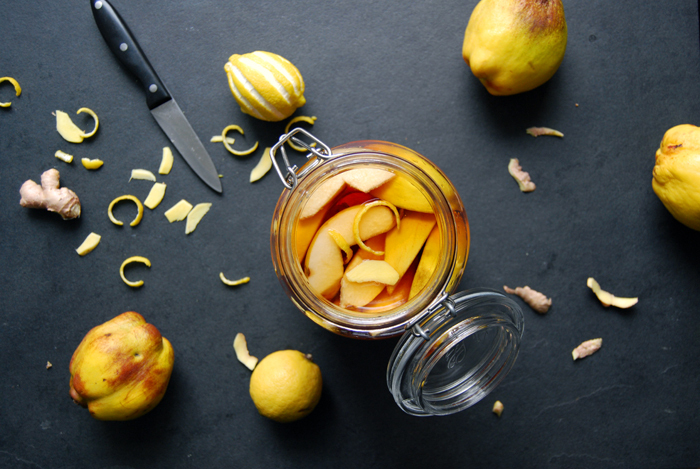 Cut the quinces with the skin and core into 8 pieces and put them into the jars, layering them with the ginger and lemon peel. Fill with the remaining brandy to the top and wait patiently for about a week, shaking it every couple of days before you start to use it. Oh, I loved it, I used it for my mincemeat for the mince pies, for my Christmas pudding and for every cake and cookie recipe that asks for a shot of warming brandy or whiskey! I also love to deglaze seared meat or vegetables with it. I do love Nigella’s recipe a lot, I’ve been using it for years, but I can’t say that I prefer one over the other. 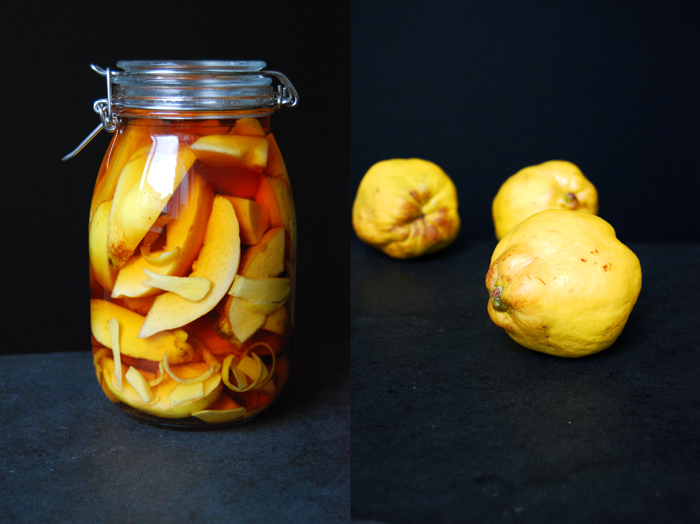 The ginger and lemon make it a bit more fruity, so I think that I’ll just prepare 2 jars this year, a Meike and Nigella brandy. i made my two jars three days ago, meike. while i wait for my espresso to do its thing each morning, i shake, shake, shake. i have had “meike brandy on the brain” syndrome since i read of this a few months back. 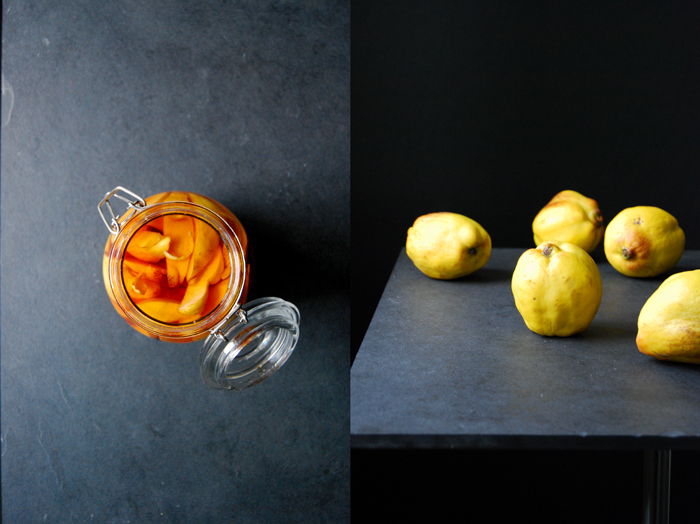 quince season arrived. i was all over it. This sounds lovely. Do you ever drink it warmed by itself?